Shot in the late 1980s, this footage and commentary documents steam operations. Featured is Canadian Pacific Railroad Empress no. 2816 in the Canadian Rockies, along with action scenes of several other classic locomotives. 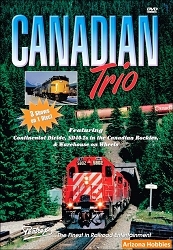 The program also includes highlights from the 1986 Steam Expo, with 21 locomotives, and the 1988 Great Canadian Steam Excursion, which ran a doubleheader out of Vancouver through mountains and canyons, and three big engines. Canadian Caboose Press, 1 hr. 55 min., all color.